This classic yellow pot has had an on-trend leopard print makeover. 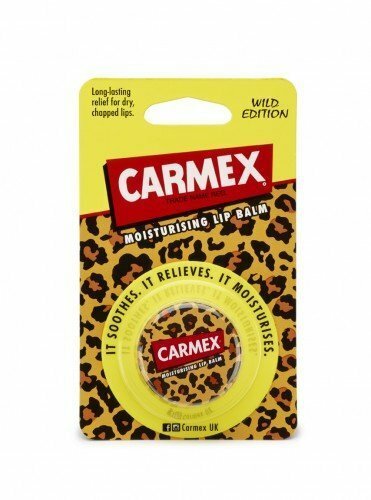 Get your hands on the limited edition Carmex Wild Lip Balm Pot. Carmex is a beauty must-have. It soothes. It relieves. It moisturises. Apply liberally and evenly as often as necessary. Especially useful before and after expose to sunlight, wind or low temperatures. Recommended before and after lipstick application to preserve and restore moisture. Reapply after eating or swimming. Petrolatum, Lanolin, Cetyl Esters, Theobroma Cacao Seed Butter, Cera Alba, Paraffin, Camphor, Menthol, Salicylic Acid, Aroma, Vanillin - our formula's are never tested on animals!